This year marks the 76th anniversary of the death of Emilie Sannom, the winsome actress-come-daredevil who pioneered the pursuit of death-defying entertainment throughout the early 20th century. Though her death came as a shock to nationwide admirers of the country’s first stunt aviatrix, friends close to ‘Mille’ remarked that she herself was prepared to pay the ultimate price for a life in the skies. “A pilot must learn to live with death,” Sannom was once quoted as saying. It wasn’t for nothing that she was often billed in her stunt shows as “the bravest woman in the world”. Sannom’s life began inauspiciously in September 1892 as the second of six children born to a working-class family in Copenhagen’s Nørrebro neighbourhood. Just before Mille’s first birthday, the family pulled up sticks and moved to Florida, where they settled at an orange farm, only to return to Copenhagen less than a decade later. Upon the family’s return to Copenhagen, Camilla Sannom pushed her daughter into acting. By her late teens, Sannom had become the reigning diva of Nørrebro Teater, celebrated for her intense eroticism, fulsome beauty, and screwball sense of humour. In her early 20s, Sannom toured the provinces of Denmark, Sweden, Norway, and Finland with the Peter Fjelstrup acting troupe – a tour whose repertory company included a then-obscure Copenhagen actress named Asta Nielsen, who would later become Europe’s leading lady of silent film. By 1906, Sannom had herself broken into the burgeoning Valby film industry, quickly allying herself with ambitious directors including Ole Olsen and Søren Nielsen. She became known for her adventurous acting style, which enhanced her rambunctious beauty in films like ‘Revenge of the Apache Girl’. Sannom’s first physically-challenging role came in 1911 as Ophelia in the first Scandinavian film production of ‘Hamlet’. In what was an unusually physically robust rendition of the doomed love interest, Ophelia climbed the roof of Kronborg Castle, climbed fearlessly up and down stone walls, and was driven over by an express train. Her 1923 film ‘Empress of the Skies’ would be Sannom’s final film role, though she left ‘Danish Hollywood’ with a bang. Aerobatics had, in fact, begun in Italy, and Danish director Alfred Lind was dying to bring the art to Scandinavian film. He is rumoured to have said: “I know a crazy girl who’s willing to make the jump,” and Sannom landed the leading role. 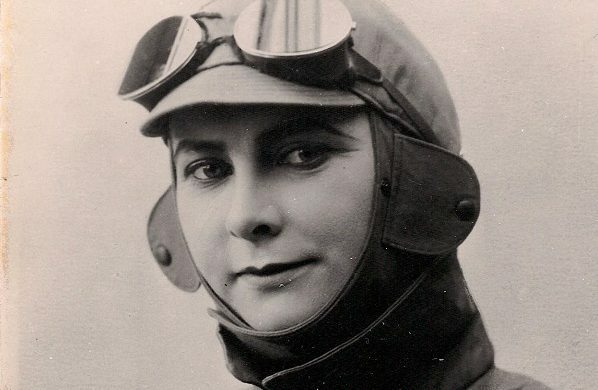 At the climax of the film’s action sequence, Sannom parachuted from an aeroplane, officially becoming the first stuntwoman in Danish history. In the meantime, Sannom had learned to fly a plane, though she was never formally licenced to do so. In the years following the end of her film career, Sannom became a full-time stuntwoman, providing airborne entertainment and heavily-promoted stunt jumps at city festivals around the country. These words echoed prophetically on 30 August 1931, when Sannom was slated to perform a stuntshow in Grenaa on the isle of Djursland. As usual, Sannom would end the show with a parachute jump, but this time was different: an airshow crew member had inadvertently sprung Sannom’s own parachute before her jump, so the stuntwoman had to use a borrowed military chute. At a height of 600 metres, Sannom sprung from the plane and the chute failed to open. Sannom failed to open the chute manually, and she was killed instantly before the crowd of hundreds that had come to see her perform. Her Nørrebro funeral drew hundreds of colleagues and admirers alike. 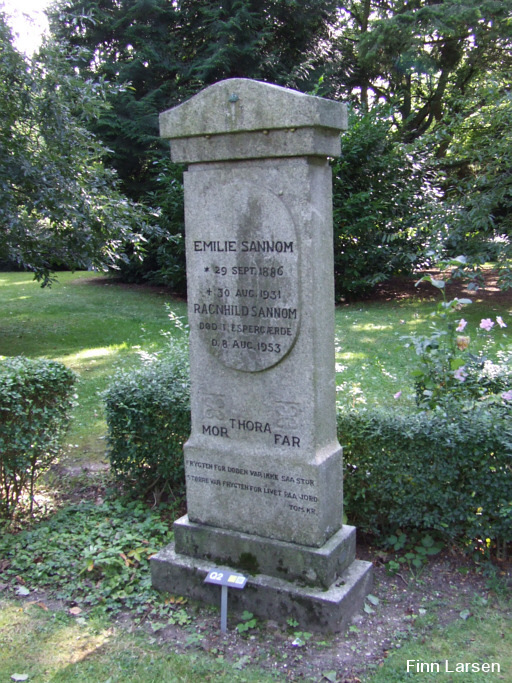 Emilie Sannom is now laid to rest at Assistens Cemetery.